Cognitive investing biases involve information processing or memory errors, whereas emotional investing biases involve taking actions based on feelings rather than on facts. 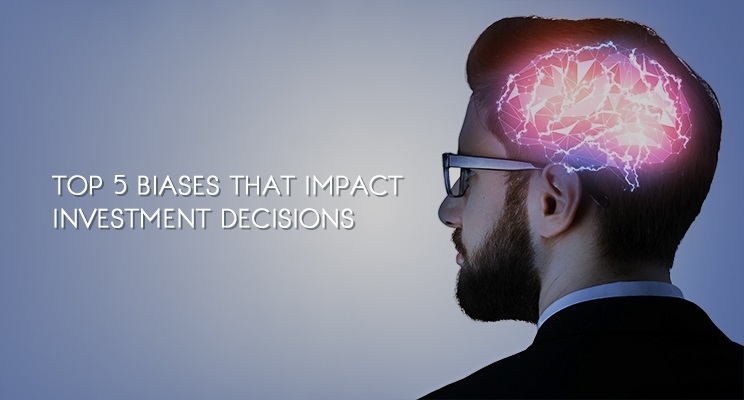 Let’s take a look at the 5 most common investment biases, along with remedies we use to minimize their impact on our clients. A common behavioral bias in investing is overconfidence, which causes investors to overestimate their judgement or the quality of their information. This can lead to “doubling down” on a losing investment instead of knowing when to cut losses, or under-reacting to important information about changing market conditions. gain in their portfolio. It can also occur when the investor experiences an isolated loss and decides not to make any portfolio adjustments for fear of further loss. Research has shown that humans feel the pain of a loss approximately twice as much as they feel the pleasure of a similarly sized gain. This can lead investors to focus on their investment declines more than gains, and can lead to inaction that stagnates the growth of their portfolios. If you would like help developing a financial plan, consider reaching out to skilled financial planner Matt Logan. We can take a look at your current financial behaviors and create a savings plan to help you reach your long and short term financial goals and enjoy greater wealth in the future. Learn more about financial and other economic-related topics at www.MattLoganInc.com Matt Logan is a Representative with Matt Logan Inc. and Summit Brokerage and may be reached at http://www.mattloganinc.com/, 336-540-9700 or [email protected]. Matt Logan Inc. is an independent firm with Securities offered through Summit Brokerage Services, Inc., Member FINRA, SIPC. Advisory services offered through Summit Financial Group Inc., a Registered Investment Advisor. Summit Brokerage Services, Inc., its affiliates and Matt Logan Inc. do not give tax or legal advice. You should consult an experienced professional regarding the tax consequences of a specific transaction. These are the views of Matt Logan Inc., and not necessarily those of Summit Brokerage Services, Inc. and any of its affiliates and should not be construed as investment advice.